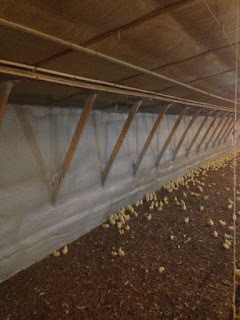 Delmarva Spray Foam and Delmarva Insulation were contracted to install sidewall spray foam insulation in three poultry houses. The customer was experiencing issues with three 50’ x 550’ poultry houses. The structures were below standard static pressure, a result of air leaking around plywood and fiberglass insulation in the sidewalls of the structures. Additionally, the block foundations were sweating which created moisture issues inside the buildings. Delmarva Spray Foam applied two pounds of agricultural spray foam to each structure. 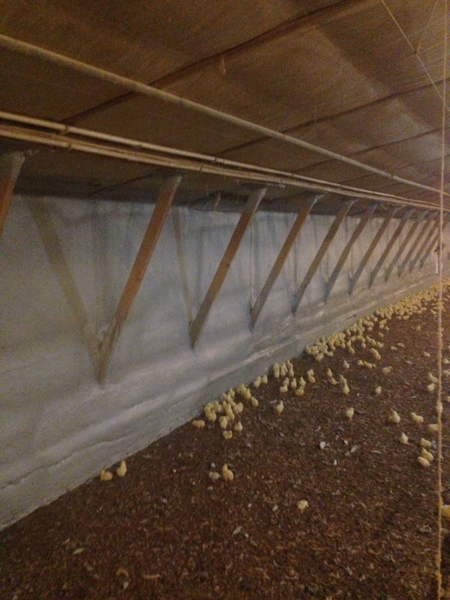 To prevent chickens from pecking foam from the walls, custom hybrid foam was installed to the lower 18 inches of the walls over the agricultural foam. This hybrid foam is a custom blend designed in partnership with our spray foam manufacturer for this specific application to protect the agricultural foam and the birds, providing years of value and performance. To further help protect the birds and the structures each foam product contains beetle agents to help prevent the bugs from eating either product. Spray foam insulation is a great product for agricultural use. Contact our office to learn more.